One of the main needs of a small business or startup is to have a reliable mail system with its own domain that helps differentiate on the Internet. Although there are lots of hosting plans offering free email accounts and even you could set up your own mail server, you are probably already used to mail services like GMail and would like to continue using it to also manage mail from your own domain without having to come to paid solutions such as G Suite (formerly Google Apps), which though inexpensive for the services you get in return, they represent an additional cost that your incipient project might not afford. If this is your case you will be happy to know that thanks to the free tier offered by Amazon Web Services (AWS) in some of its services such as Amazon SES and Lambda, you can build a mail system at no cost that integrates seamlessly with your GMail free account, and at the same time allows you to send and receive mail from multiple mailboxes within your own domain. 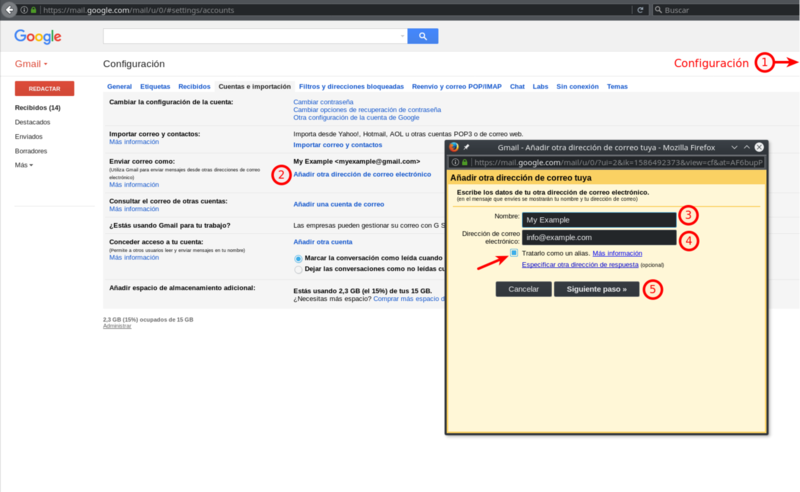 The procedure below is not exclusive to GMail accounts. Any other email service that lets you send mail choosing the name and address you want to appear in the From: field will be suitable. Receiving mail from your domain does not even require any additional feature, so any email service, whether Office 365 Outlook, Yahoo or iCloud Mail will do. 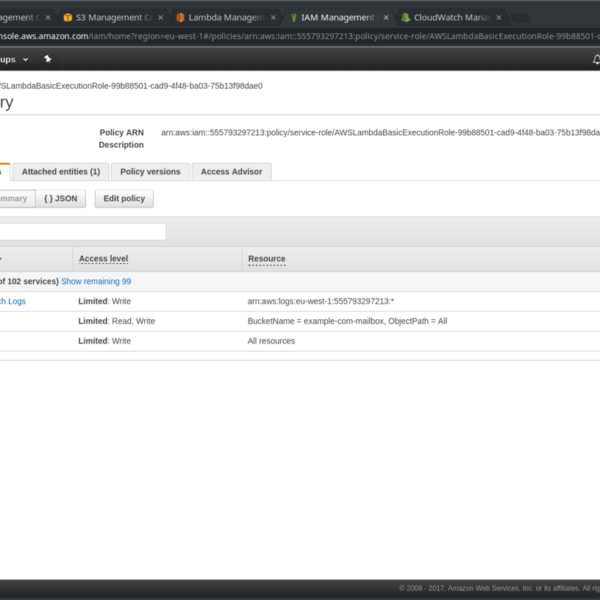 IMPORTANT: Check out the limits of AWS free tier and the costs you will incur if you exceed them. Even though they are quite broad for the purpose of this article, they could result in an economic loss that was not planned. Remember that if you carry out this procedure you do it under your entire responsibility. 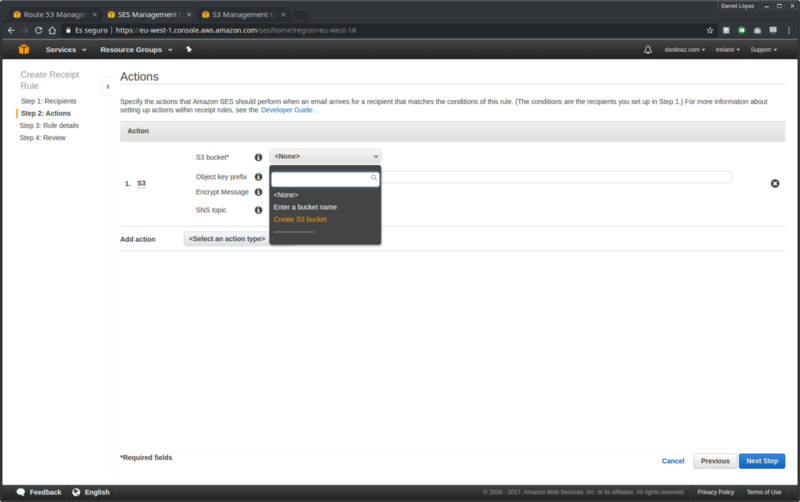 The first step is to create a Public Hosted Zone for your domain on Amazon Route 53 if you don’t have it yet. 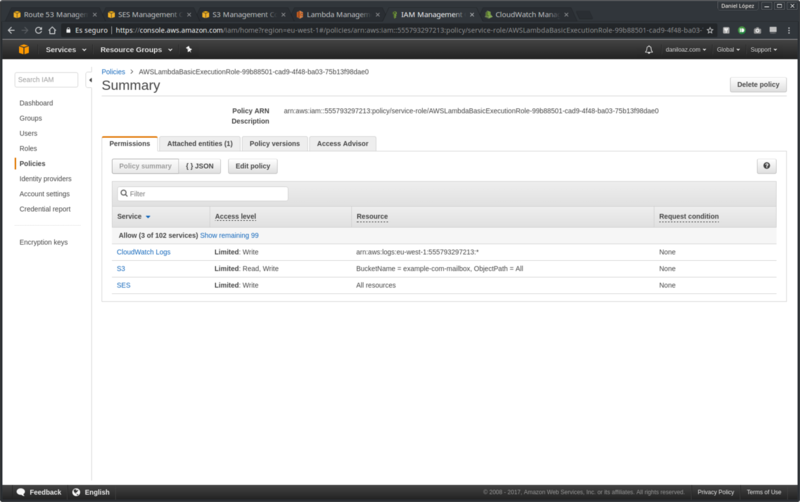 To do this, access to AWS console and go to Route 53 -> Hosted zones -> Create Hosted Zone. 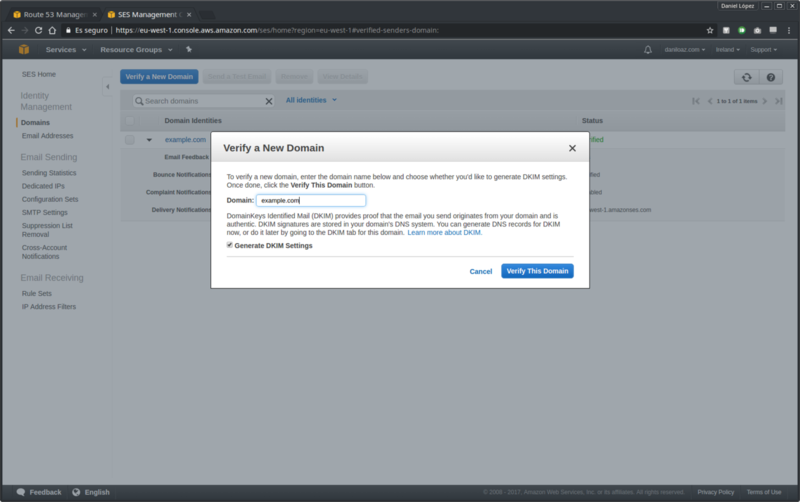 You can harness this step to add some DNS entries if you need them, such as A records that point to your website or SPF record as a security measure to prevent the email addresses within your domain from being spoofed or your messages from being considered as spam. IMPORTANT: Route 53 DNS zones cost $0.50/month per domain. 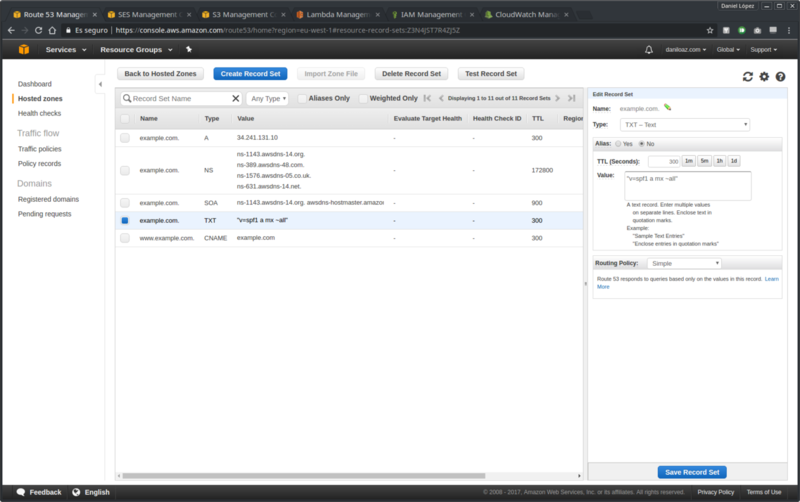 If you don’t want to incur this expense, you can copy at this point all DNS records that appear in the last screenshot to the DNS management console of your current domain registrar or other DNS provider. 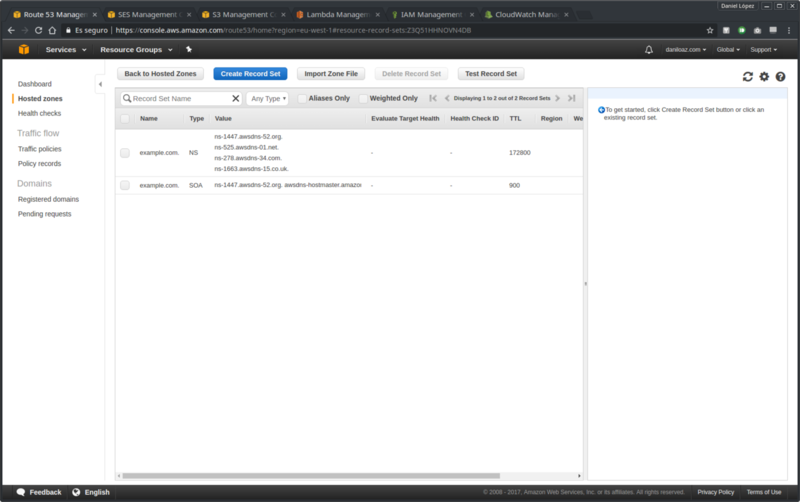 If you prefer to use the Route 53 service you will have to update your current domain’s DNS servers and put in place those provided by Amazon (NS records of the last screenshot). This point includes two steps. 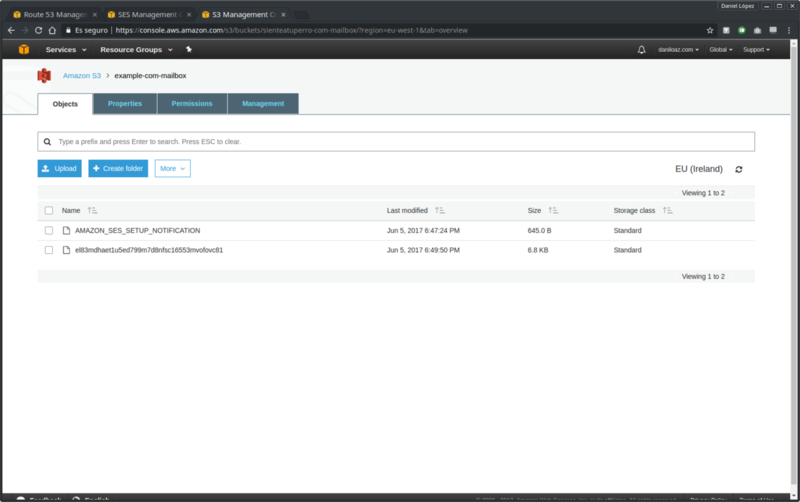 In the first place you will create a Lambda function by opening the main page of Amazon Lambda service in a new browser tab and clicking on Create a Lambda function. 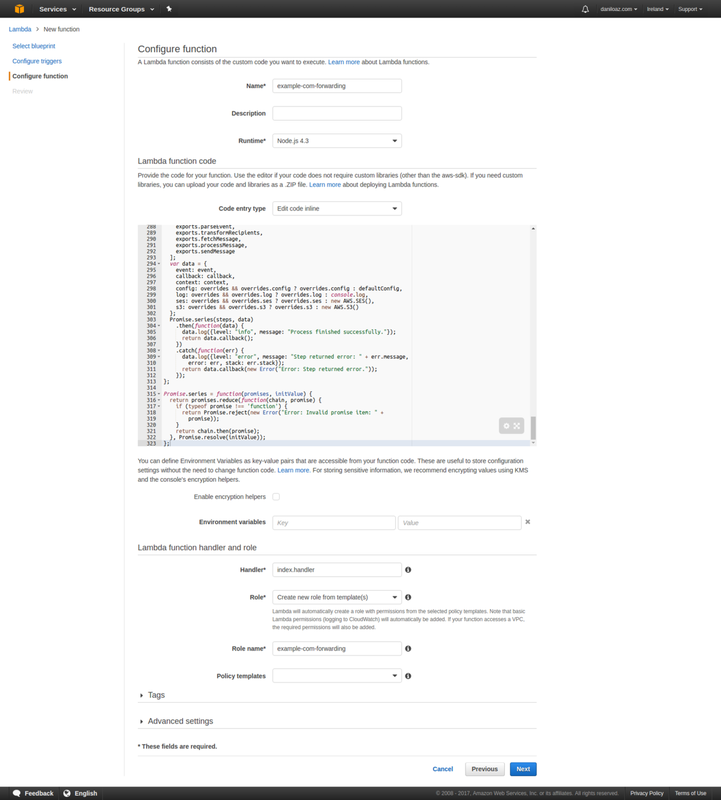 You will select a Blank Function and skip Configure triggers step. 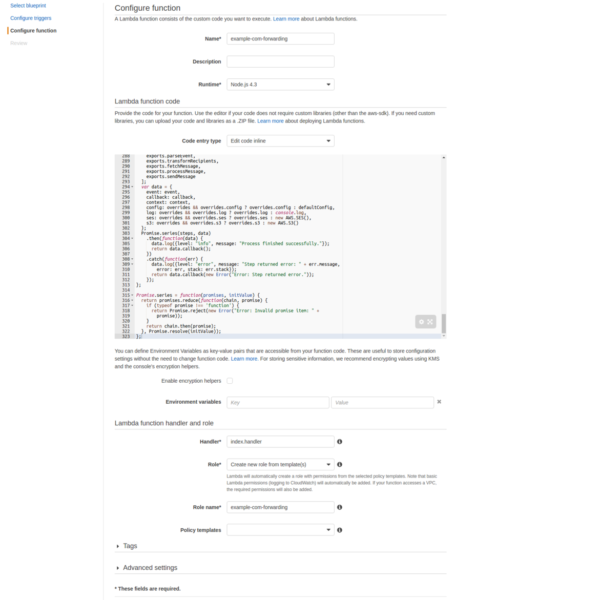 In the screenshots below you can see the form fields that need to be filled in order to create the needed Lambda function. 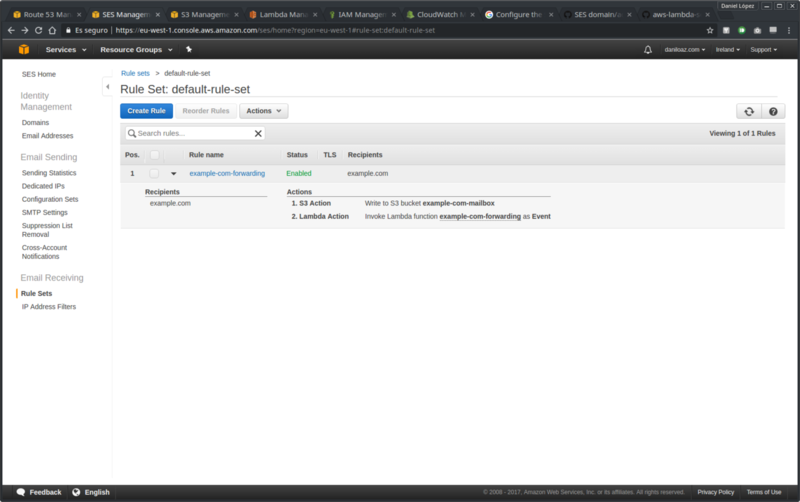 Again from the main page of the Amazon SES service, click on the Rule Sets menu option and then on the button Create a Receipt Rule, which will initiate a procedure of 4 very simple steps that will culminate with the creation of a new mail reception rule for your domain. The first of these steps will be to create one or more mail recipients. 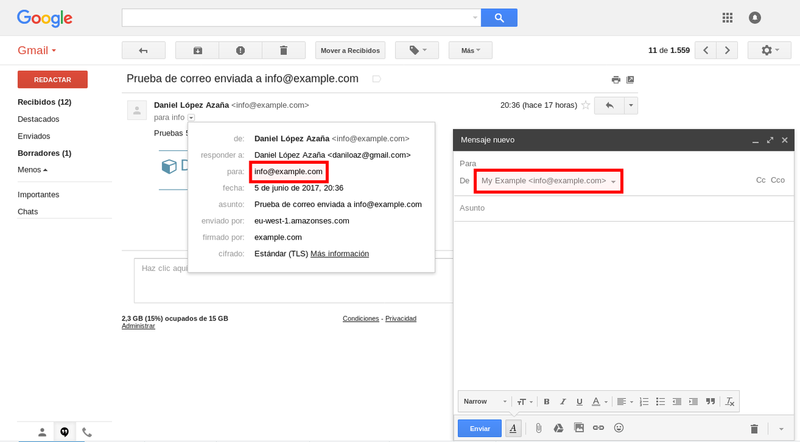 Here you can enter a single email address within your domain, or just the domain name to allow mail reception for any address. Thanks for the instructions. Unfortunately, I could not get this to work. 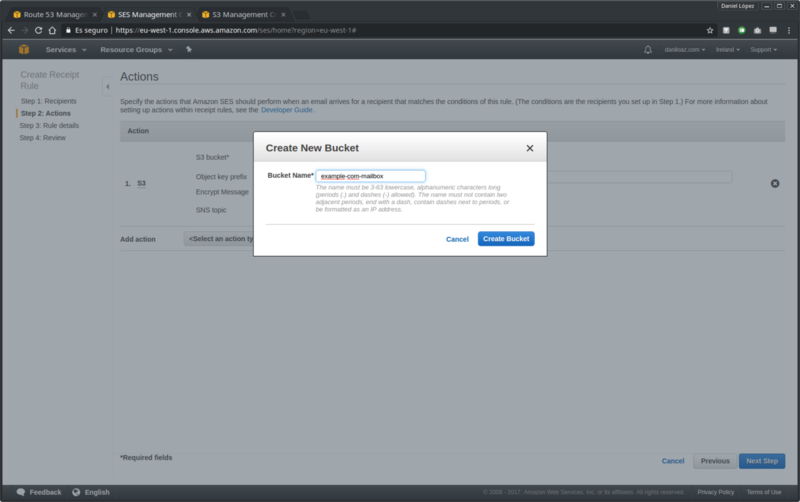 Earlier I was able to get emails to store in my bucket, but once the Lambda script was ran, it couldn’t get access to the bucket. I re-did everything, now my emails aren’t even stored inside the bucket, they bounce right back. 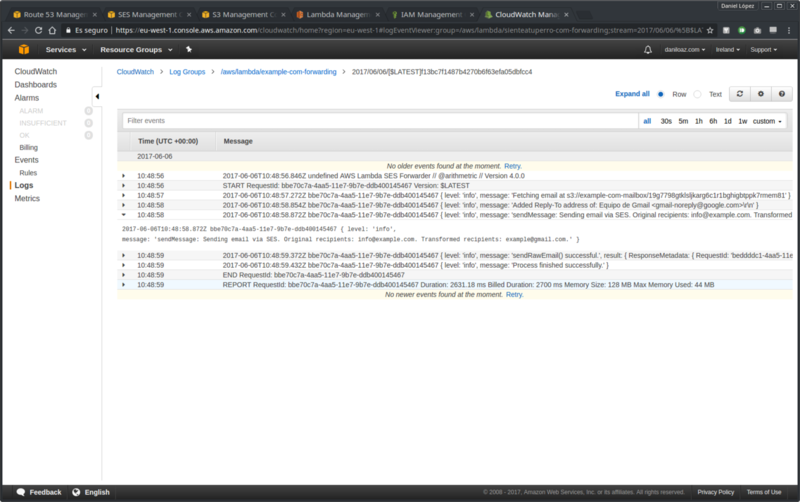 SES was unable to access the resource arn:aws:lambda:eu-west-1:ID REMOVED HERE:function:carlospwk-email-lambda. It may not have the necessary permissions. 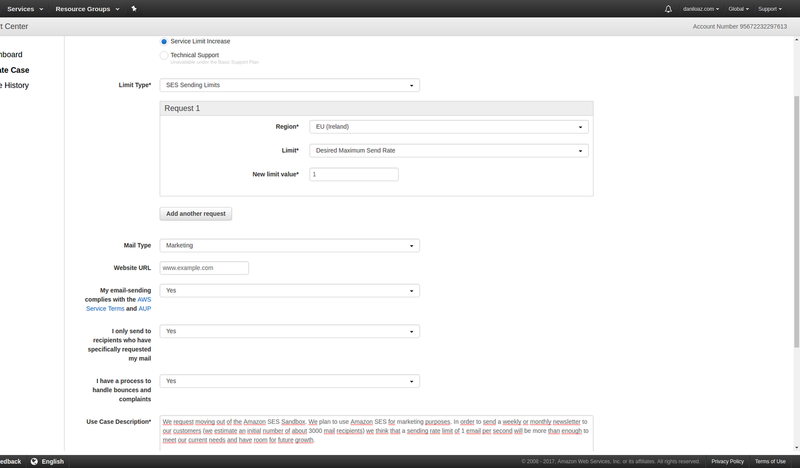 Would you like SES to attempt to add those permissions on your behalf? My only clue is that maybe something is not going according to plan when creating the Lambda function. I think the Lambda tool has been updated since this guide was written (the screenshot looks different). 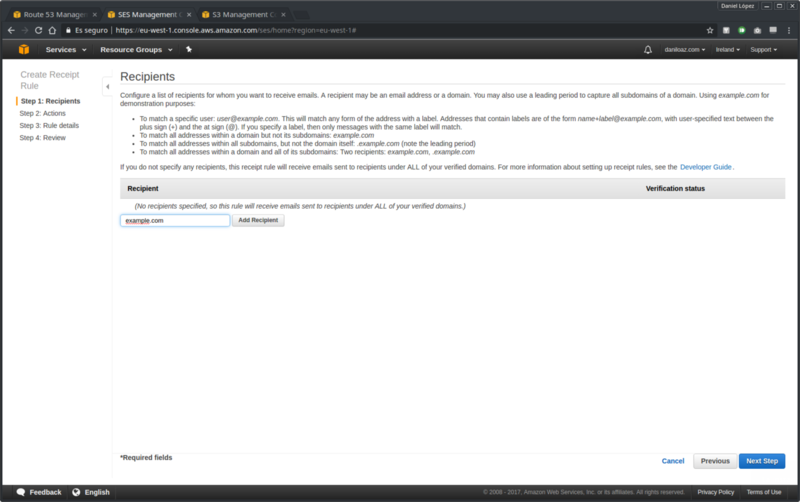 Sorry if this message seems basic, I’m new to Amazon AWS. 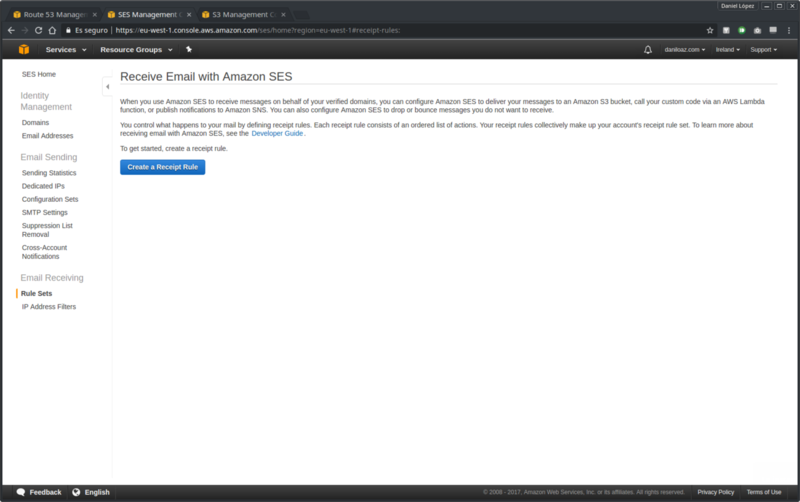 I don’t see my previous message here, but in it I said I currently my emails bounce right back when I send something to SES. I noticed that even though I created a “Rule Set” in SES, it didn’t become active. I need to go back and set it active. After that it started working again. Consider adding a little notification about it in “Step 4”. I _finally_ figured out what’s wrong with this. 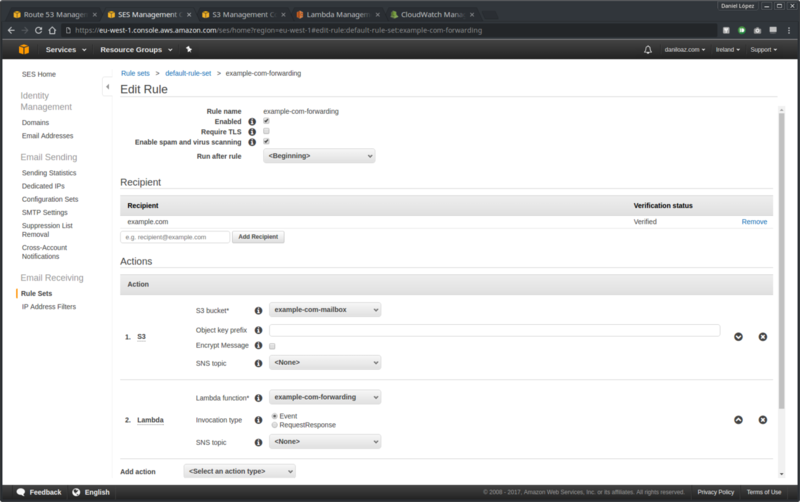 In “Step 3” there is the little config code snippet. The “emailKeyPrefix” variable no longer works if it’s just commented out. It should be empty like so: emailKeyPrefix: “”,. Once I fixed this, I started receiving email! I’m glad it’s working for you now! I’m sorry I couldn’t help you, but I’ve been so busy these days. Thanks for your feedback! Solving problems on your own is the best way to learn 🙂 Thank you for taking the time to write this guide! 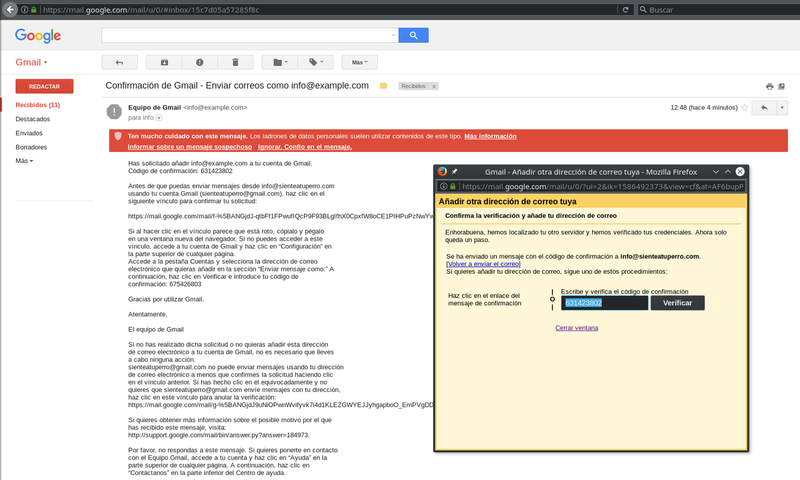 Works but not a great solution if you also want to receive mail that looks normal. Sending is flawless, but all mail received (SES forwarded on to my gmail account) shows up with correct reply-field only, but the From: field lists myself as the sender, instead of the original true sender. Huh? I’m the recipient not the sender. Apparently caused by the hack used to get SES to forward the mail in the first place. Not very usable if you want to receive email and reply quickly and not confuse the recipient, and or lose the customers email. That’s true, but it’s not a problem for me as I know that emails from a given address (you can use an inexistent address from your domain, e. g. forwarded@example.com) are actually forwarded emails and I only have to push the “Reply to” button to know the true sender’s address if the name, which is not modified, doesn’t give me a clue. From the sender’s point of view, nothing changes and it is completely transparent both when writing to us and when receiving mail from us, so I think it’s a great solution given the cost, and perfectly usable. Hi Daniel. Thanks for all your help in this post. I just had one question. You mentioned that “From the sender’s point of view, nothing changes.” However, in my experience, when I reply to the sender, the sender sees that the origin of their email is now my own domain. As if I wrote their email. Is that the expected behavior or have I missed something? Yes Marbin, I’m afraid it’s the expected behavior. You have to change the sender’s email address in the mail history below your response before you send it because although it’s name is displayed correctly, the email address is replaced by the forwarding address from your domain. I admit it’s a little annoying and you can forget about it. It is a flaw in this method, which is not perfect. Wanted to mention that, as per this StackOverflow post, if you make the replyTo address one that is not configured in Gmail, it will revert to using the forwarded reply to address as desired. https://stackoverflow.com/a/2429134/2521241 Hope this helps! I was stuck attempting to do this until I found this post, thank you very much on writing it. You may want to edit the //emailKeyPrefix: “emailsPrefix/” part though as a previous poster has stated. That helped me fix ‘copyObject() returned error:’ that I was getting. Thanks for the post. I cannot figure out step 6. You posted two pictures, but not the middle step! 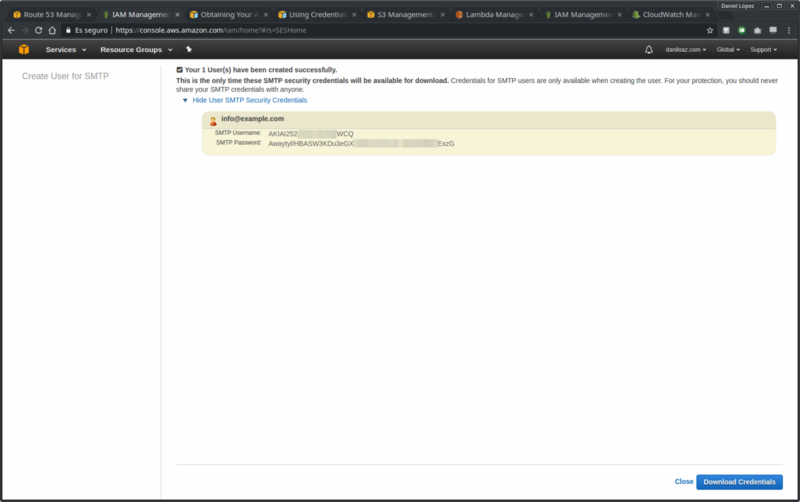 What exactly are the STMP Server, Username and Password? 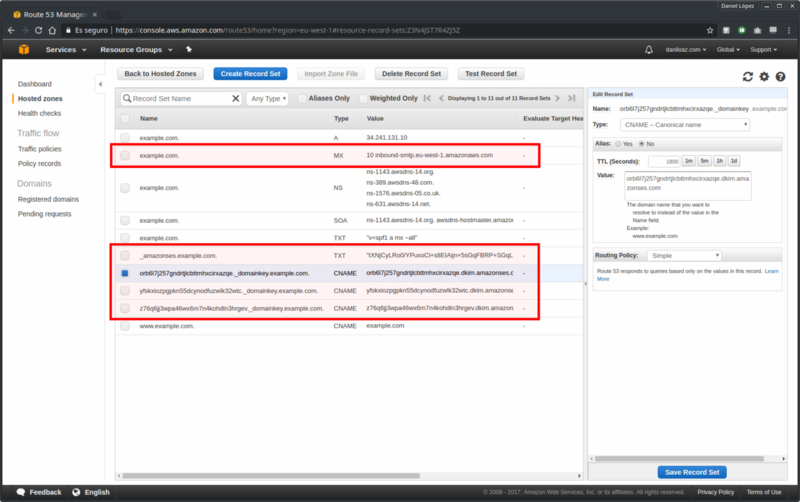 “Between the two screenshots below there is an intermediate step that consists of entering the SMTP configuration data that was obtained in step #5”. Check again step #5, there is another screenshot with that username and password. I had the same issue like you. First of all you have to add the domain to your google account! I retried today, following the same instructions that you provided. It worked. It must have been one of those things before, where I entered a typo, or was copy and pasting in a wrong field. Thank you for your thoughtful reply and thank you once again for this great article!! Amazing post! Working like charm the very first time. Very useful post. I set up a hosted domain with Route 53 last year but didn’t have mail (MX) support set up as I didn’t want to have yet another email service to worry about or pay for. This solved my problem and is up and running for me. Thanks! Hi Abdul, a POP server is used to download messages from your mailbox into an email client such as Outlook, Thunderbird, etc. 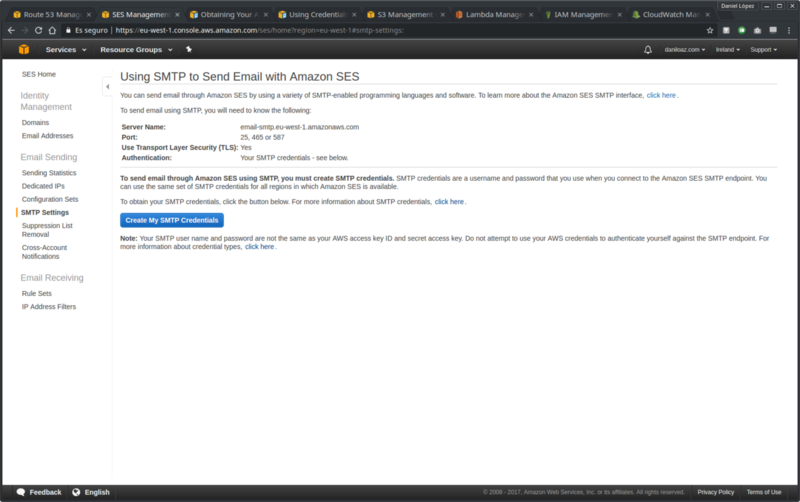 But there is no POP server involved in any of the steps of this post because the mail is sent and received through GMail using only the SMTP protocol and Amazon services mentioned, not downloaded using the POP protocol. 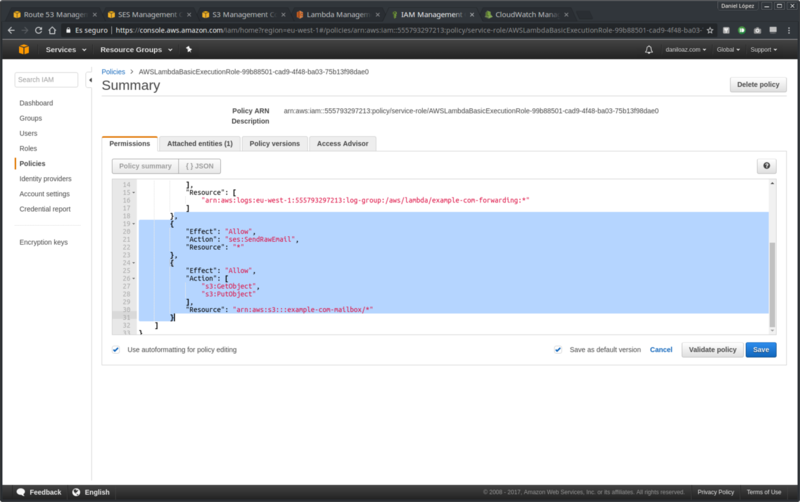 As you mention one or multiple ids can be used from same domain, Can you share info on how does it works when records are setup with cloudfare or other cdn as I am not sure will all records are affected or partial? Only those records marked in red in step 2 are affected, and it doesn’t matter what the DNS provider is, because any of them must allow you to specify a record name, a record type and a value and they work in a similar way. 1. Sending larger images(I tried over 3mb) failed. 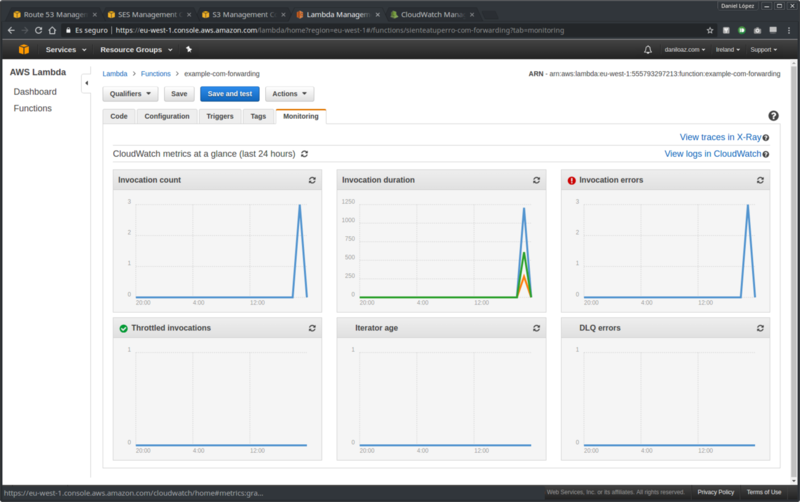 The issue was that the lambda function timeout was set to 3s. I guess it didn’t manage to send 3mb in 3s. I increased it to 3 min and now I can send larger images as well. 2. 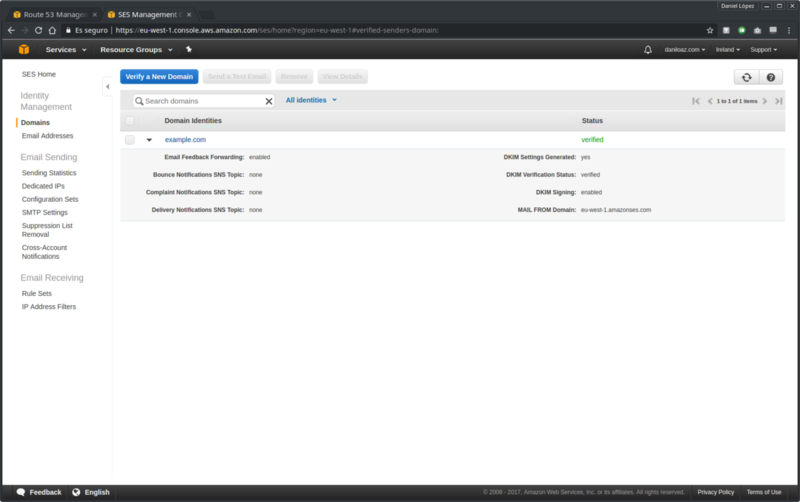 To move out of the smtp sandbox it was required to manage bounces and complaints with SNS. Just sending them to my gmail was sufficient. 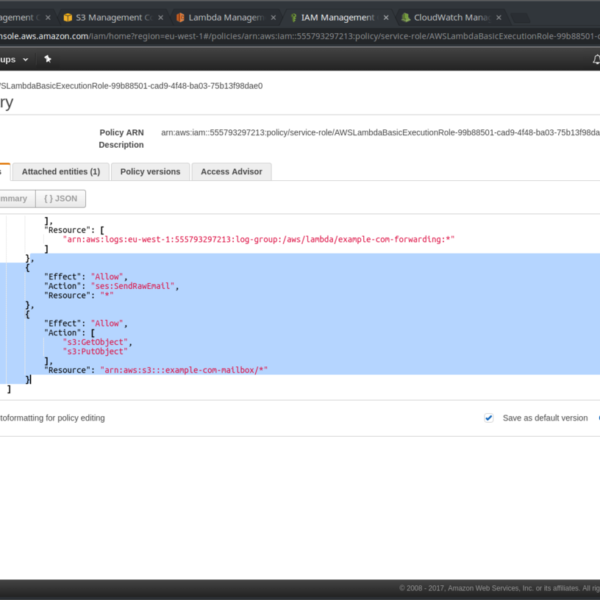 Here is a tutorial: https://medium.com/quick-code/how-to-handling-bounced-and-complaint-notification-in-aws-within-15-minutes-827972207484.